黑火子 ~Kurohiko: Why Did I End Up Falling For You? Why Did I End Up Falling For You? 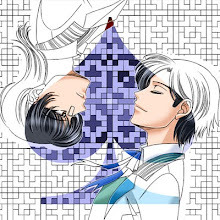 I somehow always end up liking the pairing that never end up together. 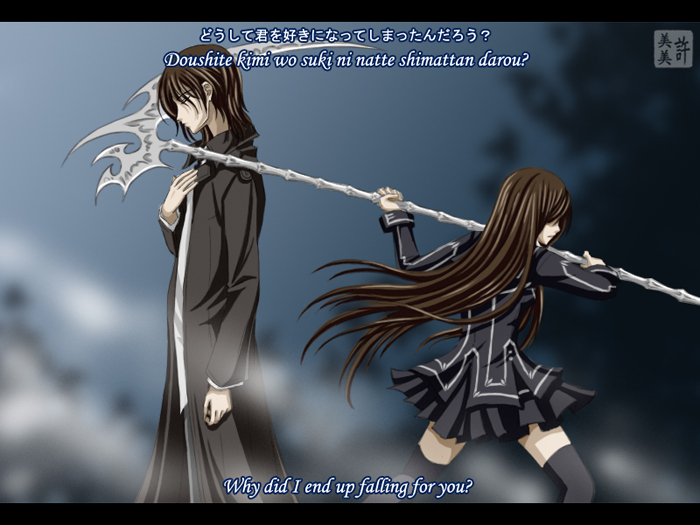 For Vampire Knight, I was a Kaname x Yuuki fan from the very beginning. The anime ended up with them nicely, but the manga is currently making me cringe. With Yuuki as the grim reaper of pure bloods and Kaname currently killing off several powerful vampires, I’m afraid that Yuuki will stop him by killing him. If this prediction of mine rings true, it makes me sad and happy at the same time. Kaname has suffered through enough with two lifetimes, so I think he deserves his eternal rest. The words are from DBSK’s どうして君を好きになってしまったんだろう？or "Why did I end up falling for you? "; a good theme for this pair, I think. Kaname will always love Yuuki even though she will never completely love him back. S-sob ;x; I adore the little brat, but he's getting ridiculous. Where did you get that picture? ?From video?